On Pleasant Hill Road, in Mayfield Township, DeKalb County, Illinois, there once was a small white schoolhouse, with a small farm cemetery next to it. It was diagonally across the road from Pleasant Hill Farm, first owned by Ira Douglass, and later owned by Gustaf Medine, and then by Charles W. Drake. Autumn is in full swing already, and school is well underway. 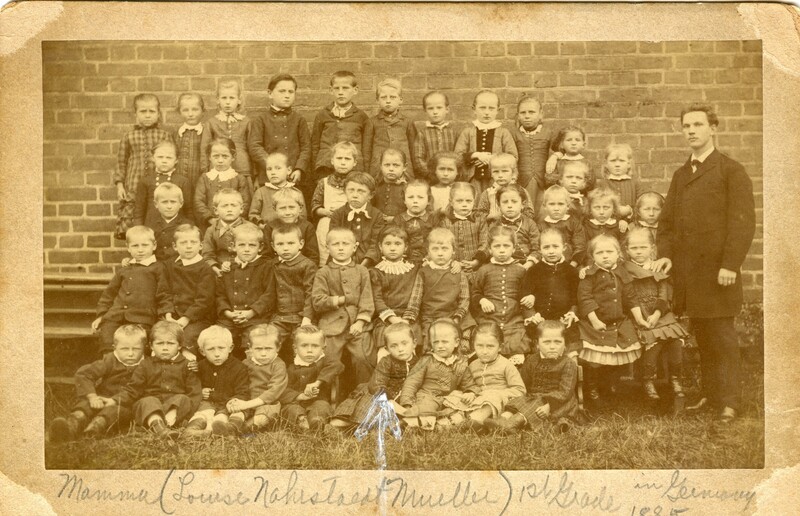 I recently re-discovered this old class photo amongst my scanned family photos. My 2nd great-grandmother, Louise Marie Nahrstaedt, was born in Sandau, Germany, in 1879. As far as I know, her family lived there until 1891 when they emigrated to the United States, settling in Chicago, Illinois. This image is a class photo from 1885, when Louise was in first grade. She is the girl circled in the front row. She seems to be very good friends with the other three girls in the front row, because they are all sitting close to each other, holding hands or linking arms. I wonder if she was still friends with them when she was 12, leaving for the United States, and if they were, did they ever have a chance to write to each other and remain friends? Would she find close school friends here in the United States? Only time will tell! When I was growing up, I saw my maternal grandparents (Ed and Millie Drake, who we call Nana and Papa) nearly every day. Papa would take my sister and I to and from school every day. He was very interested in our school lives, and knew all of our friends. He had attended high school in the same building as me, 68 years before. Papa had lots of hobbies, but he was never a huge sports fan. He’d casually watch whatever sport was in season at that time, and always followed the Cubs, but otherwise wasn’t devoted to one sport or another. That’s why I always found it puzzling when he asked how our high school basketball team was doing. I wasn’t friends with anyone on the basketball team, and I barely followed our high school teams anyway. I didn’t find out the reason for his interest in high school basketball until I was a freshman in high school. My great-grandfather, George Weil, grew up in an orphans’ home in Pennsylvania. This unique time in his life always intrigued me, because we never knew much about his time there. In the past few weeks, I’ve learned a lot more about his story. George Weil and his friend August Potrafke at the Orphans’ Home in 1904 when they were both 15 years old. George looks small for his age!